Kate and Ken Taylor purchased the inn in January 2019 after falling in love with Mendocino. 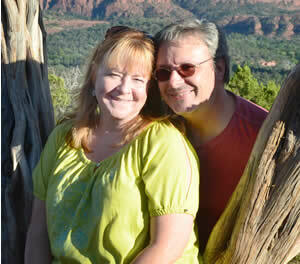 We are former Pittsburgh (PA) residents, lived in California since 1994 and first-time inn owners. We have many years of experience in education, business and information technology. Before buying the Joshua Grindle Inn, Kate was a teacher/principal and currently oversees seven private elementary schools in California. Ken worked at IBM Storage Division prior to spending time at several Yosemite area lodges. We are very excited to welcome guests to this beautiful location. The Joshua Grindle Inn is Mendocino’s first bed and breakfast (opened for business in 1978). The original Victorian farmhouse was built by Joshua Grindle in 1879 after receiving the property as a gift from his new in-laws (who just happened to live on a farm directly adjacent). We are situated on a knoll overlooking the town of Mendocino on California’s beautiful North Coast. We are 160 miles north of the Oakland Airport, 180 miles north of San Francisco International Airport, 100 miles NW of Sonoma County Airport. The Main House is the stately Victorian Farmhouse with a wrap around veranda featuring 5 guestrooms featuring antique furniture, each with it’s own upgraded modern bathroom. Also housed in the Main House are the Parlor (complete with historic photographs of Joshua and Alice Grindle) and a spacious dining area featuring a vintage pine table and chairs.. The historic water tower is a 3 story replica of the original tower featuring 3 unique guestrooms and “widow’s walk” at it’s peak. A “saltbox” Cypress Cottage offers two additional guestrooms shaded by giant Cypress and amidst a canapé of rhododendron. We are within easy walking distance to the fine restaurants, shops and galleries of the historic village of Mendocino and the breathtaking coastal Mendocino Headlands which makes the Joshua Grindle Inn the perfect portal for your exploration of the Mendocino Coast. Private parking lot on the premises. The inn has been through three sets of loving hands over the years and it has enjoyed an abundance of admiring guests who have felt it’s magic.